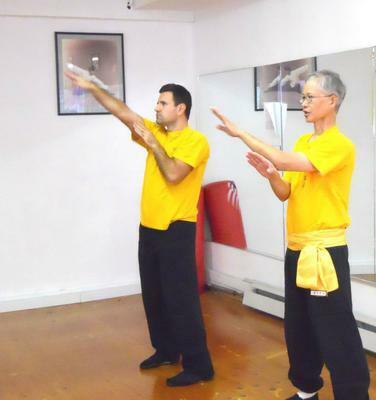 Our Kung Fu program focuses on traditional Wing Chun. The dedicated student can elect advanced training including Shaolin styles, Chinese weapons, wooden dummy and joint locks (Chin na). We offer intensive weekend seminars focusing on special topics. Come and observe a class in Kung Fu and Tai Chi, and participate in specially priced week trial programs. We are conveniently located 2 miles north of Route 80, exit 30 (Howard Boulevard). Wing Chun is known for its street combat effectiveness. If you are looking for a down-to-earth, sensible approach to real-life fighting and self defense then Wing Chun is the answer. The basic philosophies of the Wing Chun fighting system include centerline theory and straight line attacks. You learn the concept of economy of motion and how this will quicken and focus your attacks. You will use every part of your body as a weapon and as a blocking instrument. Wing Chun does not require learning dozens of forms. There are only three empty-hand forms, two weapons forms, and one wooden dummy form. The simplicity of the system makes it an ideal martial art for defense. We drill "sticky-hands"(Chi-Sau) practice. This special type of practice drills you on very close-range fighting. This type of exercise is very fast and helps develop sensitivity, speed of attack, and quick reaction time. This leads to "sticky-legs" exercise and eventually leads to blindfolded Chi-Sau. All these exercises try to get as close to real fighting as possible, thereby making you an effective fighter in the streets.